t*rexes and tiaras: Organised Chaos.. I don't think anyone would ever describe me as particularly organised. Certainly not anyone who knew me very well, anyway. I'd describe my life as organised chaos to anyone who asked, I guess. Naturally that meant that on Friday morning I'd not really started packing for the trip I was leaving for on Friday afternoon. Yes, that same day. I'd kind-of made a list. Here's what I ended up with, for 10 days in France; the first week of which will be spent relaxing by a lake, followed by a weekend in Paris. I've never been that good at capsule wardrobes, or packing light, but I did try hard here. 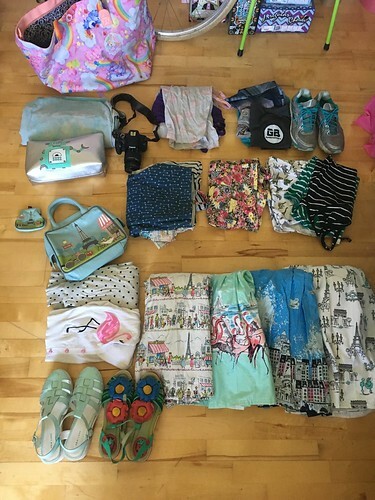 From the top: I packed all this into my huuuuuuge Care Bears holdall, which was an IG competition win and has come in useful for so many trips since. Towel and washbag containing all of the essentials. I didn't go for travel-size anything, because I'm not restricted on baggage on the way out. Instead I took things which I know I'll finish whilst I'm over there, so I don't need to fly back with them. Camera, PJs and running gear - I love exploring places I'm staying, and try to do that by running when I wake up (since I tend to wake much earlier than most of my guests). I'm still not a fan of running (see this post for more of my thoughts on the subject) but it's a nice way to explore somewhere new and get some time with my thoughts. And my iPod. This amazing Paris theme handbag is a Yoshi one - they're just brilliant when it comes to cute designs and I picked it up very cheaply on eBay with it's matching purse, in advance of my trip. I know I'm a geek, but I'm cool with this. I recently finished these Turia dungaree shorts, and have brought a selection of vests and tees to go with them. Also my floral playsuit, because it's a staple when I go anywhere and it's sunny. And the dinosaur shorts I made last year before my America trip, plus some more tees. We have a week of pretty much relaxing / doing very little planned, so I've gone for pretty casual attire. Two cardigans, which will go with anything (in my world anyway). four dresses for the days in actual Paris itself, and two pairs of sandals. Now, what have I forgotten...? There's bound to be something. Looks very organised. We are camping in the Chilterns and my husband forgot his towel, shower gel, waterproof trousers and proper raincoat! We were completely soaked in a constant deluge as we walked!! Miserable!! !